We don’t want to get too sappy, but we love our delicious Publix Premium Pure Maple Syrup. Whether we’re drizzling it over pancakes or sweetening up a salmon recipe, we love uncapping the sweetness that comes from these bottles. Like with most things, making this delicious product doesn’t come easy. Did you know that it takes 40 gallons of maple sap to make one gallon of pure maple syrup, and it takes trees about 40 years before they’re big enough to tap into? That’s crazy! Here’s how our maple syrup makes it from tree to shelf. Did you know that syrup starts as maple tree sap and goes through a beautiful transformation to become the syrup sold on our shelves? Sap is made as the trees mix ground water with the sugar inside them. In the beginning, the sap is mostly water and two percent sugar. While it’s only harvested for about six weeks between March and April, the process to make maple syrup takes a little bit longer than that. Spiles are inserted into trees by hand. Using a drill bit, a small hole is drilled into the tree and then gently tapped completely into place with a hammer. The warmer spring temperatures help maple trees turn their stored starch back into sugar. The cooler temperatures at night followed by the warmer temperatures during the day create enough pressure to help the sap flow out of the tap hole. The sap is quickly drawn into storage tanks using a vacuum pump and taken to a sugarhouse. Sap is put through a reverse osmosis machine that takes some of the water from the sap. The liquid is transferred to an evaporator, then boiled so the rest of the water completely evaporates. As the water evaporates, the sap thickens and the sugar caramelizes. When the temperature reaches 219 degrees, the syrup is ready to be drawn. The syrup is filtered, tested for thickness and graded for its flavoring and coloring. The syrup is packaged and sent to your local store. On the other hand, the flavor of the maple syrup depends on other factors like the tree, location and soil. These factors combined determine the value of the syrup. 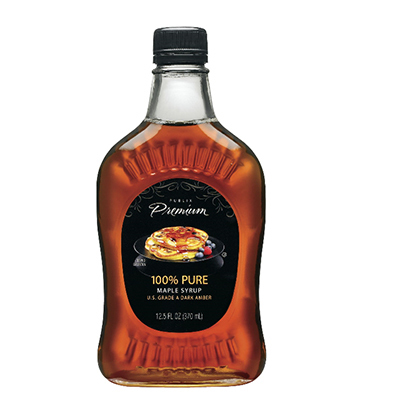 Our Publix Premium Pure Maple Syrup is a U.S. Grade A dark amber syrup. This means the syrup is produced near the end of the harvesting season. Compared to lighter syrups, ours has a richer taste and darker color. Publix Premium Maple Syrup can be found at your local Publix! Let us know on Facebook, Twitter and Instagram if you pick some up!